Cherry Deluxe: This traditional luxury kitchen features beautiful cherry wood cabinets, professional stainless steel appliances, and a large bi-level island with a raised bar. Wine bar cabinets on the far wall unite the great room to the kitchen. Angular Kitchen Island: The large kitchen island features ample space for bar stools while displaying decorative cherry wood panels and support corbels (wood brackets) below the granite overhang. The pendant lights above the island add dimension and character to the room, while providing light to the surface of the island. Also note how the shape of both the island and ceiling soffit coordinate in a way that helps to visually separate the kitchen from the great room. 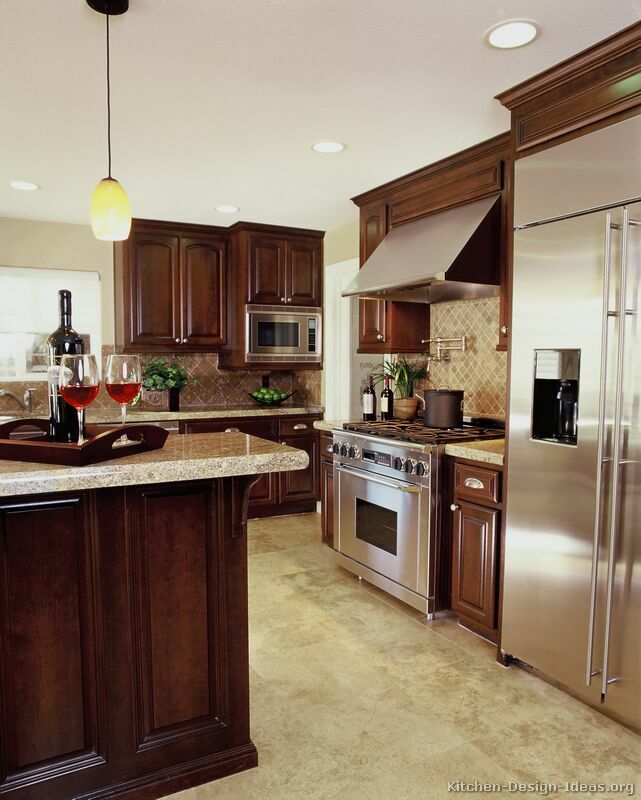 Professional Appliances: No amenity is neglected in this luxurious kitchen. The 48-inch wide built-in refrigerator has an in-door ice and water dispenser and is situated for easy access to guests seated at the island. A pot filler faucet on the backsplash behind the range allows the cook to access water without traversing to the main sink. The built-in microwave sits nicely in the corner without grabbing too much attention, and is mounted lower than the upper cabinets for easier (and safer) access. 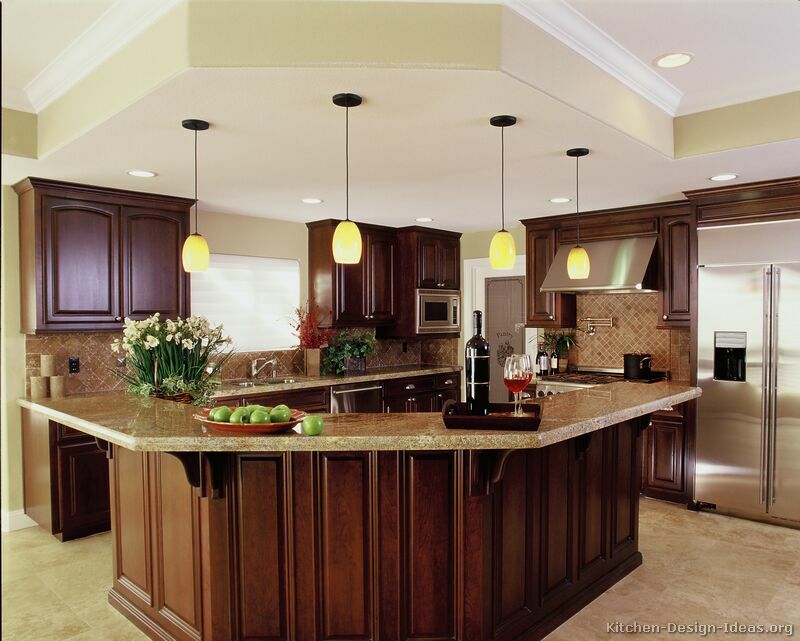 Materials & Colors: Travertine tile flooring, beige granite countertops, and a travertine tile backsplash (set at an angle) coordinate nicely with the dark cherry cabinets. Additional colors in the decor, such as the yellow pendant lights and the decorative green plants, add life to the color scheme. Beige painted walls contrast softly with the white ceiling and glass pantry door to round out the mix, allowing the beautiful wood cabinets to maintain their visual prominence in the room. 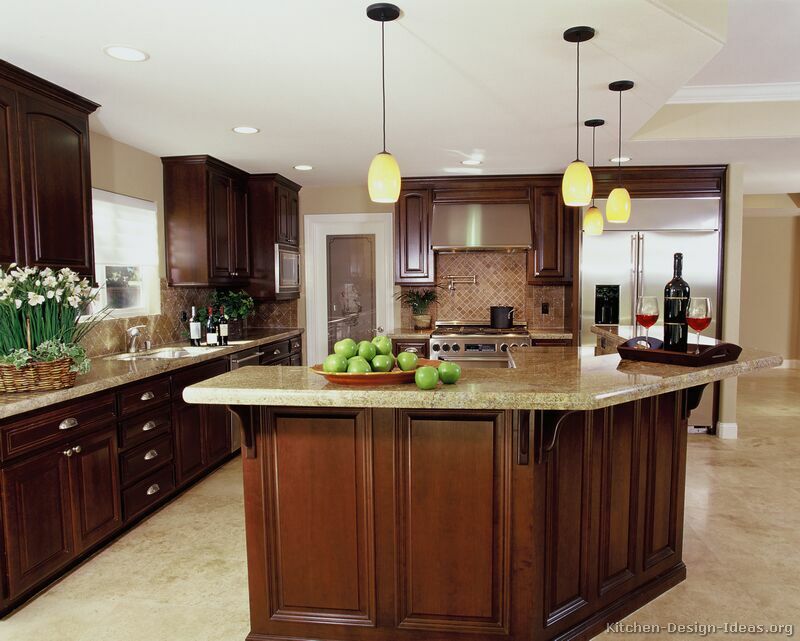 Similar Pictures: This kitchen is photo #4 in the Traditional Dark Cherry Kitchens gallery. 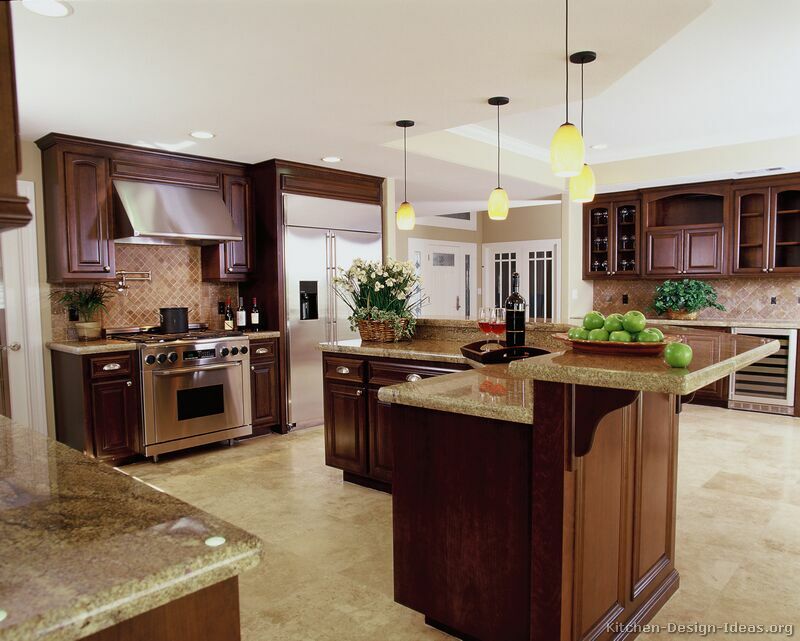 You should also check out our popular feature article and photo archives on Luxury Kitchen Designs.